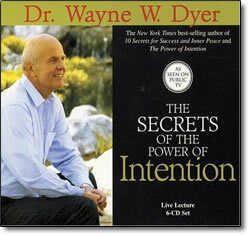 Secrets of the Power of Intention – CD by Wayne Dyer – Discount! Intention is generally viewed as a pit-bull kind of determination propelling one to succeed at all costs by never giving up on an inner picture. In this view, an attitude that combines hard work with an indefatigable drive toward excellence is the way to succeed. However, intention is viewed very differently in this recording. Dr. Wayne W. Dyer has researched intention as a force in the universe that allows the act of creation to take place. This audio explores intention—not as something you do—but as an energy you’re a part of. We’re all intended here through the invisible power of intention. Throughout the lecture, Dr. Dyer shares stories about his childhood, including living in an orphanage, riding on a trolley as a child, and his intention to be on the Late Show with David Letterman. He also reveals his personal struggles and how believing in the power of intention has brought him peace in his life. You’ll hear Dr. Dyer quote scholars who view intention as an energy source, including Mother Teresa, Max Planck, (Nobel Prize recipient for his work on the atom), and many others. Healing, manifesting your desires, and creating miracles are genuine possibilities—and indeed, probabilities—when you listen to Dr. Dyer and connect to the power of intention!